Senator Boats | Baby we were born to run.. fish. 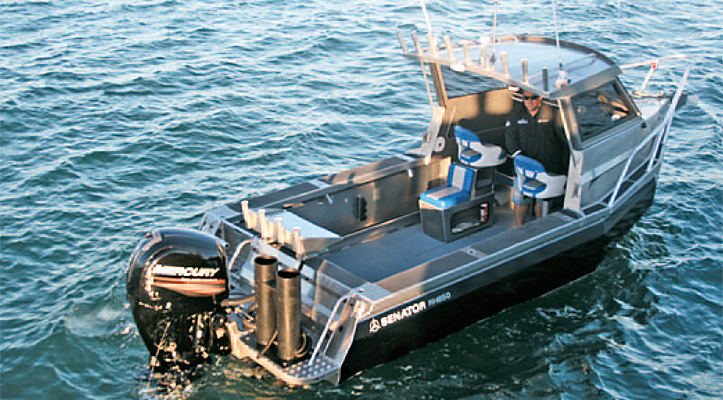 I’m sure it won’t come as big news to anyone but, as a pretty general rule, aluminium pontoon boats are not the marine world’s prettiest creations. Their very nature requires that their hulls protrude outwards from where even the most basic of aesthetics insist they should be; and the sheer bulk of those hulls makes it almost impossible to attractively get from the width of the transom, around the cabin sides to the pointy end of the bow. That said, some pontoon boat manufacturers make a much better job of it than others. And, in this humble scribe’s opinion, Senator Boats is one of the very best. That view was further enhanced when I first saw the new Senator RH650 on its tandem trailer in the Half Moon Bay Marina carpark early one March morning. Perhaps it was the fact the sun was only just thinking of getting up, perhaps it was the 650’s black hull. Regardless, this did not look like a typical pontoon boat.